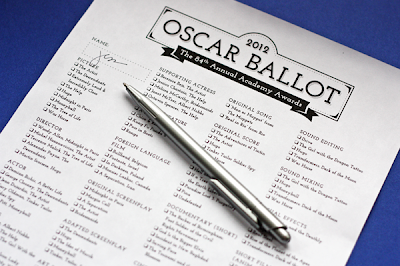 Update: Looking for the 2013 Oscar bingo and ballot? Get it right here. Hosting an Oscars party on Feb. 26? I've made up 20 different Oscar bingo cards you can print out, along with a matching ballot for guessing the Academy Award winners. And like every year, a big disclaimer for the game: it might be possible to win ten minutes into the telecast, or maybe there won't be any winners at all. Who knows? But based on personal experience, I can say it's really fun to play. A bingo refresher: The first person to mark off five squares in a line wins. It could be a horizontal, vertical, or diagonal line, and the center square counts as a freebie. To keep the PDF file sizes smaller, I've split the bingo set into two files of ten pages each. Save a file to your computer, open it in Adobe Reader, and print the number of pages you need at 100% size. Download the first set of 10 cards. Download the second set of 10 cards. Bloggers, like you: Generous, creative, fun, and great. Thank you. Thank you for making these again—I used last year's set at my Oscars party and they were an enormous hit! How fun! I think I need to have a fun little party now :). Thanks for sharing! Absolutely love it! Used it for my oscar party and it was a hit! Once again, thanks for sharing. Love these! Oh how fun - Thank you - Thank you - Thank you. This is such a generous give-away. Your time spent is truly appreciated. Your bingo cards have become tradition at my Academy Award Party. Thank you! Thanks so much. These sound like fun! So great! Thanks so much for sharing! Adorable and hilarious, as always. I'm so glad you make these ... now I just need to throw a party! This is brilliant. Every year we focus on the food and the ballot is always something scrubby we pull out. This year, there's no excuse. THANK YOU. Thank you so much for this post. I want to let you know that I posted a link to your blog in CBH Digital Scrapbooking Freebies, under the Page 5 post on Feb. 07, 2012. Thanks again. this is really awesome!!! I wish I could know that I'd have the following Monday off and I'd sign up to host a party so I could use these terrific cards and ballots! Really lovely, thank you for sharing these with us! I have been looking all over for Oscar Bingo cards. Thank you thank you. Our Oscar party grows every year, and this is a highlight! I love, love, love your blog and I love, love, love this idea! Thanks! oscar bingo was such a hit at my party last year, i love these cards!!! These were a highlight of my annual party! Thanks so much for putting them together...I've been checking your site everyday for them for the past few weeks! Enjoy the AA's! Great! Enjoy! Fingers crossed that they'll work out well for everybody. I seem to be having a problem getting the oscar bingo to open. the ballot opened fine but i'm getting an error with both bingo files. I need these for an event. Can they be emailed to me? It works for me when I try to download them, but if you still can't get it, send me your email address, Erin. Thank you for these! I can't wait to use them. My Oscar party is going to be epic. Thanks, I looked for new bingo cards a couple weeks ago and hadn't found any for 2012. Thank you sooooooooo much! These look great! Everyone, have fun at your Oscar parties!!! p.s. I also wanted to let you know I posted a link to your Blog on the Academy of Motion Picture Arts & Sciences FB page. I'm so humbled. Oh my goodness. I didn't think I would win, so I didn't prepare a speech. I would like to thank God, my agent, and my family. It's been an honor just to be nominated along with the other amazing games out there. I snagged these from you last year and had so much fun, I had to come back for more! Thanks for creating these - they're great! Thank you Jessica! Love that you made a 2nd set of bingo cards too - we will be more than 10 this year again, so we will use them! Thank you thank you thank you! I used this last year, too, and it was such a hit. You are my best! These are fabulous-used them last year and it saved me hours of time trying to assemble a trivia game- everyone liked this better ! We used thm with teams at our party. Question-does anyone know best link to look up winners as they accumulate or right after ceremony ends? Keeping track reduces my drinking time!! I know what you mean! Good question... there must be somewhere, right? This is exactly what I was looking for! Thanks so much, Jessica! These are fantastic, thank you!! Thanks! We love to play Oscar bingo and I love that the items are current for 2012! This will be fun - thanks for sharing! Just what I was looking for! Thank you for your time in developing the Bingo Cards. Bound to be a big hit at our party this year. Cheers! Just posted it on my design blog (http://chic-type.com/blog/) with a link back to your site :) Can't wait to play! Thank you soooo much!! I used your bingo cards last year and they make the Oscars a lot more enjoyable, especially with the men folk! thank you so much you rock! Fantastic! We just happen to be doing an Oscar party at work... These are perfect! You are a wonder. Thanks a lot! Be sure we'll use them! Thanks for doing these. Im having a party and I know these will be great fun. Thank you so much for putting these together! We used them last year for our Oscars party and it was such a hit we are using them again this year. Thanks, again! Ok, I have been searching for a week for a nice, clean Oscar ballot that isn't covered in advertising and websites and links...so thank you for that. But to stumble across this bonus game of Oscar Bingo? Seriously...thank you. This surprise little extra will just add to the fun of the evening! This is ssoo awesome! thank you for creating these, fantastic! Thank you so much! This will be my first Oscar party and I'm excited to have your resources to make it a hit! This was such a hit at our Oscar party last year. Thank you again. Amazing! I am going to share this on my blog -- love it! Prepping for my 3rd annual Oscar Party with my Bunco group -thanks for the Oscar Bingo alternative! Love your designs. Love this..what a great addition to my Oscars party Thank you! The best set of Oscar Bingo cards...well done! Thank you for sharing! These are too cute. Thank you so much! We love throwing Oscar parties and this is the first year we are including BINGO! Susie, I'm not sure what the trouble would be. The bingo files are a little larger; maybe wait a little longer for your computer to download them? Thanks a million! I noticed Oscars.org didn't have suggestions for 2012 parties so I started hunting for entertaining ideas. Am so glad I found your site. I plan to visit frequently! Thank you for taking the time to create and share these. Just what I needed to add more fun for Oscar Sunday. Thanks for creating these yet again! I think this s the third year my friends and I have used your bingo cards, and they always make our party more fun! This is so much fun! Thank you and congratulations on your name being mentioned in Woman's World. That is where I found your blog and your offer for the Oscar bingo. I'm invited to an Oscar party so I can't wait to add this nice touch. You are very sweet for your offering to the world! Thank you so much! I was looking everywhere for some good ones. Thank you so much!! I would like to thank you very much for the printables ! Hooray! There are only a few people coming over but this is sure to make our first ever Oscar party an annual occurrence. I just love How About Orange. Thank you for your generosity. SO much fun THANK YOU SO MUCH!!!! Thanks so much for these! They are awesome. Our family will have lots of fun with the bingo cards. Thank you so much for making these! As there wasn't any sports on tonight I convinced my family to play along with your bingo cards. Despite not having seen most of the films it was sooooo much fun. It was a real interactive family night. I hope you do this again for next year's Oscars's. My friend and I played. We each had 5 cards. It was a blast! We were fascinated how you knew who the presenters were. Except Halle Berry, what happened with her? Used both your BINGO cards and Ballots for our Oscar Party last night with my girlfriends and we had SO much fun with them - we were on the edge of our seats till the last winner - waiting for them to tell their kids to go to bed and for the dog to take the stage! Lots of laughs and fun! Thanks for doing this!! I hope you do it next year - because this worked out sooo well!! Thanks for sharing! Yay! Glad you had a great time! And it's a tradition, so I'll definitely make more next year! Great Oscars bingo cards! I printed out a batch of them for a party last night, and everyone had a ball checking of the particular moments indicated on the cards. We went for a full card bingo, to make the fun last all show long. Thank you! Just wanted you to know we really enjoyed this last night. Thanks so much for giving it to us! Thank you for the Oscar ballots and bingo! We used them at our family Oscar party last night. So much fun. My Aunt was so happy that I sent the PDF's to her so she didn't have to track down some tacky ones! Yours are so professional and nicely done. How did you know there would be a dog on stage? Weird. Just wanted to let you know that we used the bingo cards all the way over here in Australia. LOVED IT!! Thankyou so much for sharing it with us freely. Hello! These ballots and bingo cards are great! 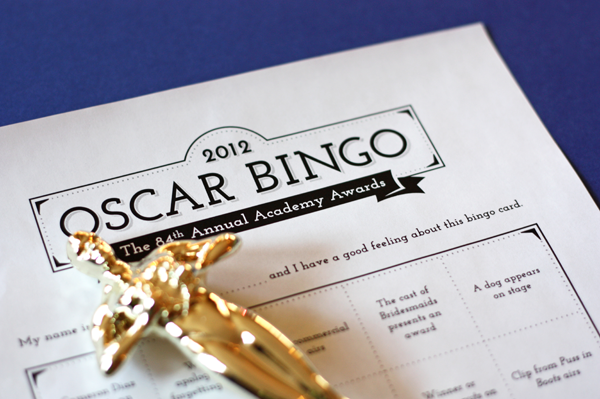 I was wondering if you had some blank ones or an editable copy that I could use to make some for the 2013 Oscars. What a great idea to make them!! Hi! I don't have blank templates, but I'll be making the 2013 version soon. What is a vcf file? I signed up for the list to get to get the 2013 version but all my mac seems to recognize is a contact card for our address book. That's just an address book file that Mail Chimp, my email service, automatically adds. I'll be sending out the email with the bingo files later today to everyone on the mailing list.